A quick note to all my Bloggy Friends to have a wonderful and lovely day! Whether you celebrate Valentine's Day or not, I hope you remember to take the time to tell someone dear to you that you care and appreciate them. Or maybe do something unexpectedly nice for a friend, neighbour, or co-worker just to brighten up their day. It's amazing what a little gesture can do to a person's spirit, and who knows, maybe they'll pay it forward? Or be like me and buy yourself some yarn. Cause you love you, right? And what better gift to give a knitter than a skein of lovely yarn?? And before I get a bunch of messages and comments about me being on a "yarn diet", one of my rules is that gifts don't count. So what if the gift is from me? 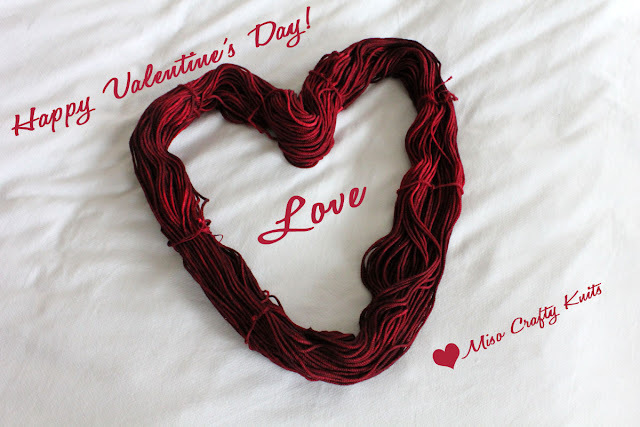 Ok, have a love-filled day my Knitterly Friends! you're bad... you should punish yourself with some chocolate ;) Have a happy heart day!